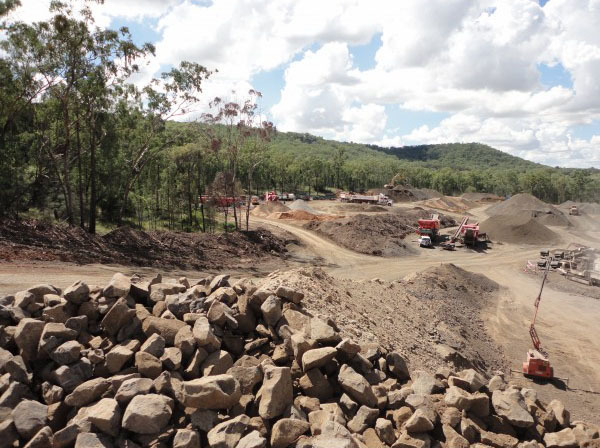 Byrne Resources offer quarry rocks such as virgin rock and builders rock for projects across Brisbane, Waterford, Queensland-wide and throughout Northern NSW. The best rock retaining walls Gold Coast has to offer typically features quarry products like builders rock including blue metal rock. Virgin rock creates stable and striking finished products, and it's also great as drainage rock to keep your site water-free. Civil works companies and owner-operators know that they'll get their pick of quality granite rocks when they work with Byrne Resources. You can find our quarry rocks in Brisbane, up in Byerwen, down in Northern NSW and out in Waterford. Get drainage rock for your project in Pinkenba and Eagle Farm from Byrne Resources. Searching for a reputable and dependable source for all your drainage rock or builders rock? If so, look no further than Byrne Resources. We have a variety of quarry rocks available including 150mm-300mm rock, 200mm-400mm rock, 800mm rock and blue metal rock. These high-quality granite rocks are perfect for constructing the rock retaining walls Gold Coast residents are so fond of having by their homes and businesses. No matter if your next project is in Eagle Farm, Central Queensland or Brisbane, we can bring all the quarry products you need to design and build your next project. Our drainage rock can help to keep your site free of water and stable before, during and long after the construction process is over. On the Gold Coast, in Pinkenba and all Queensland-wide, this is important to have a solid finished project. For projects that require virgin rock in Millmerran and Byerwen get your quarry rocks from Byrne Resources. We've taken on very large projects for civil works and mining companies as well as smaller projects for individuals and smaller companies in Waterford and Central Queensland. You'll get the peace of mind that comes with knowing that you're getting only the best granite rocks to use in your project. We'll take the worry away and let you focus on other areas of your project. Contact Byrne Resources today for a free quote on virgin rock, blue metal rock and more. For virgin rock and blue metal rock in Eagle Farm, Millmerran, Northern NSW and Queensland-wide, contact Byrne Resources today! Tell us what you need and we’ll give you a free quote.